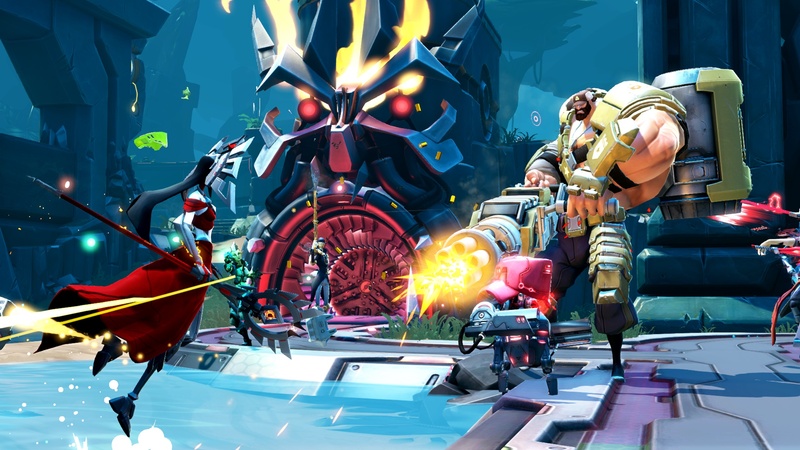 2K Games and Gearbox Software unveiled the new PvP modes for Battleborn last week. After trying it out for ourselves, Shacknews asked a little more about this side of the game with producer Chris Thomas. Last week marked a momentous reveal for 2K Games and Gearbox Software. Paris Games Week marked the formal reveal of Battleborn's competitive multiplayer modes, which will pit teams of five heroes against one another. Shacknews recently had an opportunity to go hands-on with the newest part of the campaign mission and the newly-revealed PvP modes. But in-between sessions, this writer stopped to get a word with producer Chris Thomas about the differences between the two game modes, the Gear system, and also whether the team received any feedback over the summer. Shacknews: In what ways does Battleborn's PvP differ the most from the game's campaign? Chris Thomas, producer: The biggest difference is that you're fighting against other players. With the Campaign, you have five players and you can do the co-op story mode, which you can play by yourself, as well. But here, it's all 5v5, so it's all getting a chance to match your team and your particular character and those skills sets against another team, who are obviously trying to kill you or kill your base. For me, the PvP mode is a lot of fun, because when you get all those different characters together and those special abilities firing off at once, you've probably seen how crazy it can be. Especially once everyone has their Ultimates unlocked, you've got missiles and magic and all kinds of stuff happening at once. It becomes chaotic, but it's a lot of fun. Shacknews: I've noticed through my sessions that, at most, we've only been able to reach level 7. Are the rates of skill unlocks going to change? Thomas: That's actually really fluid. That whole system is super fluid, so it's easy for them to adjust all those numbers. The closed technical test that we're doing, that's one of the goals is to get a lot of people in and playing, so Gearbox can start fine tuning those numbers. Over the past year, we got to a point where it feels pretty good, but we know there's still room to improve exactly what those unlock ramps are. Everything from damage that players do, to the rate you unlock your skills, to the rate you level up your actual characters, all that stuff is super tuneable, so they're going to continue to fine tune that right up until release. Shacknews: Are players expected to handle the Helix skills in PvP the same way they would in Campaign? Thomas: That system doesn't change, from PvP to Campaign. What I found is that when I'm playing Campaign mode, it's a really good chance for me to take the time to really read all of those different skills and become familiar with how I want those unlocks to happen. Because based on what you're playing, what your team composition is, whether it's PvE or PvP, all of those things matter in the changes that I'm going to make. A lot of times, I'll jump into the Campaign mode and play a character that I don't play as often and I'll learn what all those different skills do and how I want that unlock tree to happen. And when I jump into PvP, it'll be like quick fire, I can just fire it up and mash through each one of those decisions every time I level up. Shacknews: We've seen how teamwork affects the Campaign, but does that teamwork change at all when going into PvP? Thomas: It really depends on the character you're playing, in a lot of respects, especially the support characters, they've been designed to stand on their own, that they're a lot of fun, that they can do plenty of damage, they can kill enemies, and you don't feel like you're stuck doing nothing but support. Depending on how you select your different options from within the Helix, that'll change how your character functions during the match. So if you want to be more efficient at dealing damage with Miko, for instance, you can take different choices so that you're a better fighter. Or you can say you want to be "super healer guy" and make sure you're helping your team, you can configure your options to make yourself a super healer guru and help everyone else that's dealing all the damage. Shacknews: Are there any particular characters that you feel are better equipped or better suited for competitive play? Thomas: Hmm... that's a good question. I think there's always going to be some, depending on what your play style is. You mentioned that you played Oscar Mike. I find him really fun to play in PvP, because I add his skills where he does a lot of damage coming out of being cloaked, so I do a lot of sneaking around and coming up behind people and doing a ton of damage that way. I've seen people that really love the melee characters and love getting right up in people's faces and doing damage that way. Even the support characters, you can tune them so that they're really efficient in PvP. So I can't say there's really one that's better than another in PvP. It's really all just depends on what your play style is. Shacknews: There are a lot of character moments in the Campaign where two characters will talk to one another or riff off each other. Will we see that same thing in PvP? Thomas: There's some of it. I wouldn't say there's as much as in the Campaign, because you're going to have those story moments and those scripted moments where it makes sense for the characters talk to each other. But there are some aspects in PvP where the game recognizes who you're attacking, who you're killing, who you're getting killed by, so there are some moments where you'll hear some VO that's personalized between the characters. Shacknews: Can you talk about the new Gear system and how it differs from previous Gearbox efforts like Borderlands? Thomas: It's really different. The only thing I can say is really close to being similar is just the rarity, the colors and stuff. The whole Gear system is pretty cool, because whether you're in PvP or PvE, you get chances to find these loot packs and these loot packs all get stored within your command area in the main menu. So when you go to that, you have this list of stuff that you found or you can also, just through playing regular matches, you'll be earning credits, so you can purchase loot packs with those credits. Those loot packs, once you open them up, and there's going to be a random chance that it'll be a rare thing or common thing and those will be similar to Borderlands, where you'll have your greens, and purples, or blues. You'll see the rarities change. And depending on what you're doing, like let's just say you're in the Campaign and you're taking on this really tough boss, there's going to be a higher chance that the boss will drop a loot pack that has a higher chance of coming up with a purple. Once you open all those packs, you'll have this big list of gear that you have and you can go through and figure out exactly which ones you really like, which ones will do best for you depending on PvP or PvE, and assign them to different loadouts. And when you go into your matches, you can select those loadouts on the fly. So it's pretty cool, because you set up different ones for a PvP match, so you might need stuff geared towards keeping you alive, or a more straightforward one for PvE matches. It's actually a pretty robust system and we're still finding all the crazy combinations you can do once you start digging into those loot packs. It's... kind of hellish to test, actually. Shacknews: You took Battleborn to Comic-Con, you took it to PAX Prime, you gave the public a chance to try it out. How has their feedback affected the game's development? Thomas: So far, it's definitely affected some aspects of the development. The cool thing about Gearbox is that they're constantly playtesting. So even though it was the public's first chance to see this game, we've had a constant stream of feedback, because they have testers coming in all the time. It's almost a weekly thing that we see changes in the builds, whether it's balance or something else. We've gotten feedback from people on forums or people that have come into Gearbox to playtest the game. So that stuff has changed a huge amount over the past couple of years, just like watching people go, "This is kind of a s***ty skill, so let's change it!" And they'll totally revamp it and it'll be something similar, but more effective. We'll playtest it in the game and we'll wind up with something that feels a little more fun and engaging. It's a constant back and forth. 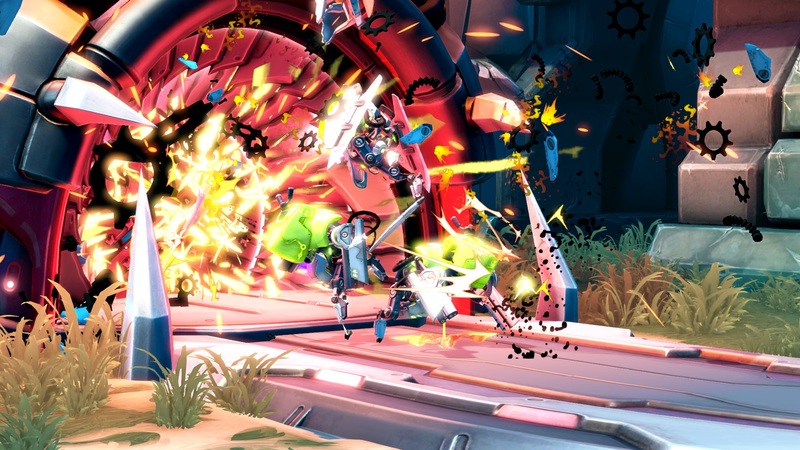 Battleborn is in the midst of its closed beta. An open beta is set to launch soon, with PlayStation 4 users getting it first. Look for Battleborn to arrive on February 9.